The final Harley drive sprocket has a rubber isolator that is designed to absorb energy, or cushion the sprocket. 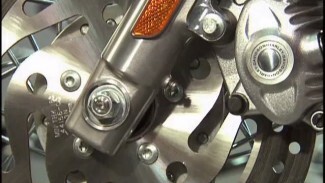 Harley Davidson released touring models with sprocket isolators in 2008. 2008 models have a stand alone design. In 2009 the isolator and sprocket assembly changed and has stayed the same to present day. Mike shows us how to perform a quick inspection on the isolator. This is the most common way people will inspect the component. 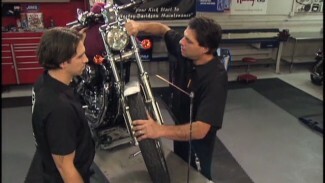 We also has a video that covers the inspection as specified in the factory service manual. Support the motorcycle in an upright position and in neutral. Do not jack up the rear wheel or relieve it of any natural weighted pressure. 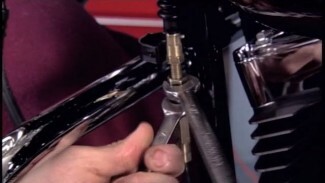 Remove the left side saddlebag, then hang a weighted string on the left axle spacer as close as possible to, but not touching, the rear sprocket. Apply a small piece of masking tape On the face of the sprocket where reference marks can be drawn. Rotate the sprocket forward, by hand, until it stops (do not allow the wheel to move or you will have a false measurement). Holding the Harley rear sprocket in place, mark the masking tape in line with the string. Now, rotate the sprocket back, in the opposite direction, until it stops and make a second mark in line with the string. Measure the distance between the two marks. If the measurement exceeds .400″ (10.2 mm), the rubber isolator should be replaced. It is not common for isolators to be excessively worn before 40k miles. Mileage, age, weight of rider(s) & cargo, and riding style all contribute to wear. In fact, it is not uncommon to have a motorcycle with 60k miles that has an isolator that is still within spec. It is important to inspect the Harley rear sprocket and isolator at regular service intervals. We suggest performing the factory inspection for your first inspection. This will give you an accurate idea of what the dealer is looking for and give you a good sense of feel for the inspection. After that, a quicker inspection can be more than sufficient.